Frederick Medical Supply and Dr. Frederick's Original is dedicated to making you a happy customer. No matter what. 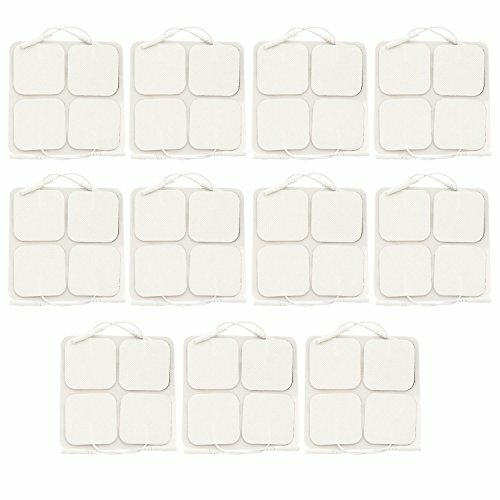 44 UNIVERSAL NEUROSTIMULATOR PADS - 2 Inches by 2 Inches: Chronic pain is a drain on your energy, but with a bulk pack of Dr. Frederick's Original MultiStick Pads, it doesn't have to be a drain on your wallet. FITS YOUR DEVICE OR YOUR MONEY BACK: Buy with confidence knowing that if the leads don't fit your device, we'll make it right. Compatible with: Empi , truMedic , TENS 7000 , Healthmate forever YK15AB , Balego , TENS Pro , TENS 7500 , iReliev , PurePulse , ZEWA , Kedsum , Magicfly , AccuReliev , Belmint , Chattanooga Intelect , Santamedical , Tyco , ChoiceMMed , easy@home , TENS 3000 , InTENSity and most other TENS with 2 mm male pigtail connectors. MultiSTICK TECHNOLOGY FOR REAPPLICATION: Our super sticky pads can be reused for multiple sessions without losing their adhesive power. Better yet, they won't leave a bunch of sticky residue on your skin like some competitors. PRE-GELLED FOR EASY USE: Don't fumble with sticky conductive gels any longer. Our FDA approved pre-gelled formula provides a super stick AND superb conductivity. 'HEAVY DUTY' UNIVERSAL LEADS: Our universal leads won't break or pull out of the pad, which saves your skin from those jolting shocks you're used to from other brands.